In his second imprisonment in Rome where his situation seemed bleak with all his friends deserting him [2 Tim 4:16] and martyrdom obviously near, Paul the apostle writes another letter to Timothy, his beloved son, in a bid to encourage the younger man to walk in the correct path as a leader and as a preacher. Much of the letter was written in a tone that’s almost as if he was never going to see Timothy again, and it reads not unlike the wishes of a dying man. 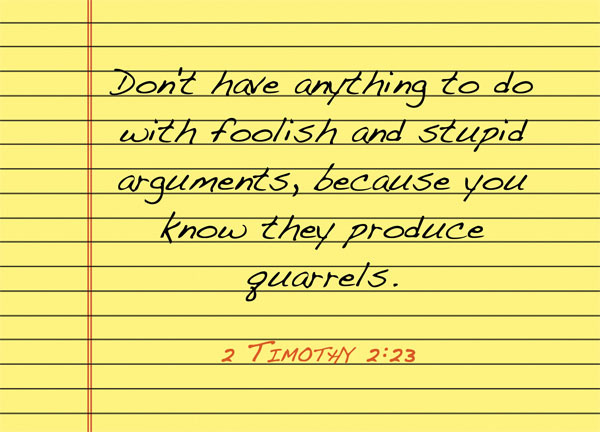 In this letter, there are especially a lot of exhortations for a leader, and in this study we will focus on Paul’s warning against foolish and stupid arguments – some of the things that Timothy was advised to flee from. foolish and stupid arguments – in the days of the apostles, the Greco-Roman influence was strong, and the Greeks especially were extremely interested in what we call ‘intellectual debates’ – in which, in all likelihood, a number of learned men gather together and argue about certain controversial topics. Many of these ‘debates’ stemmed from contentious topics cannot be settled – and even if they can be settled, they were largely not matters of consequence in the first place. These arguments are therefore a waste of time which could have been spent on matters of consequence. they produce quarrels – it is not that matters of consequence do not produce quarrels – I think people today can quarrel over all things, whether big or small. We’re so fiery, so indignant, so defensive. Anyway, it is one thing to argue over matters of importance – but to cause a quarrel over the smallest or most irrelevant thing would break the serenity of the church. Other people will be alerted, yet they gain no benefit in watching or being involved in a quarrel. If it is neither constructive nor beneficial to the growth of others, it certainly stumbles others. Furthermore, the gospel will be held at risk – quarreling over food isn’t the holiest scene you can find in the church. While ideally we shouldn’t even quarrel about matters of importance – at least they are important! Quarreling about trivial matters is really not worth the effort. Avoid contentious words and arguments, unless it’s truthfully a matter of importance. If we think about doing God’s good works as our goal, and we think about glorifying God in what we do – then foolish controversies and arguments and quarrels are unprofitable and useless [Titus 3:9]. James suggests that it is out of our own selfish desires that quarrels and fights occur amongst the members of the Church [James 4:1]. Half the time, our quarrels probably arise from a need to defend ourselves, or to put down someone else, to prove that we’re right, to satisfy ourselves that the other is wrong, and his argument is weaker. Do we help whoever we argue against to grow spiritually even if we win the argument? No. Do we help whoever listens to the argument to grow spiritually when we argue about trivial things? No. In that case, such arguments are meaningless. What about arguing about theology? To be honest, I love a good argument on theology. It’s always fun to watch people debate about theology – you learn so much at one go, you gain so much information – often, a huge chunk of the information would be inaccurate. In his letter to Titus Paul says to avoid quarrels about the law, because they are unprofitable and useless [Titus 3:9]. Often, we get so harped up on which school of thought is the right one, which denomination is most biblically accurate; even instruments can be a point of contention – harp or electric guitar? – at the end of the day, these arguments only make us blinded to what’s important, and that’s God. The spreading of the gospel. The doing of his works. The following of his commandments. These promote controversies rather than God’s work – which is by faith [1 Tim 1:4] . In the next verse Paul advises on what one should do instead of quarreling – be kind to everyone, able to teach, not resentful. If all discussions in the world will never end in quarrels, there wouldn’t be war, there wouldn’t be bitterness, there wouldn’t be hatred. Well, sort of. If you discuss, be careful not to let it escalate into a debate. If it is already a debate, be doubly careful not to let it escalate into a quarrel. If it is already a quarrel, then be humble and let go of your argument and pull yourself out of the quarrel. It requires great discipline and humility. It requires discernment as well. At the same time, while we do not start a quarrel or be involved in a quarrel, let us not listen in to quarrels as well. They ruin us [2 Tim 2:14]. After all, Paul told us not to have anything to do with foolish and stupid arguments. That includes listening and reading. Spend the time instead on godly matters.